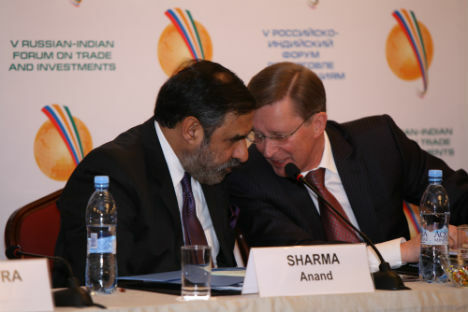 Minister of Commerce, Industry & Textiles Anand Sharma and Russia's Deputy Prime Minister Sergei Ivanov at the 5th Indo-Russian Forum on Trade and Investment, in Moscow, on Thursday. India has reaffirmed to Russia its firm commitment to continue and expand bilateral cooperation in nuclear energy notwithstanding the stalled commissioning of the Kudankulam nuclear plant, - reports The Hindu. During his three-day visit to Moscow the Commerce Minister discussed the Kudankulam issue “in the larger context of our partnership” with Russia’s Deputy Prime Minister Sergei Ivanov and Industry and Trade Minister Viktor Khristenko. “There is a very firm commitment on both sides to strengthen our cooperation in the civilian nuclear sector,” Mr. Sharma told Moscow-based Indian media before leaving for India on Friday. With Moscow completing talks on joining the World Trade Organisation, Mr. Sharma reiterated India’s willingness to sign a Comprehensive Economic Cooperation Agreement (CECA) with Russia. “We are more than willing to negotiate CECA once Russia gains WTO membership,” he said, adding that the pact will improve access for Indian companies to the Russian market through lower tariffs. Mr. Sharma and Mr. Ivanov co-chaired the 5th Indo-Russian Forum on Trade and Investment, which focused on three priority sectors for bilateral cooperation - infrastructure, innovation and commercialisation of technologies, and pharmaceuticals. In a protocol signed on the results of the forum, the sides agreed to focus on infrastructure modernisation in both countries, especially in ports, rail and roads, automobiles and public transport, as well as heavy industry. To facilitate cross-flows of investment and expertise in this sector they decided to explore the possibility of setting up Special Purpose Vehicle ог a similar mechanism to finance and manage infrastructure projects in both countries. The sides also agreed to consider joint financing of projects and technologies in РРР format, especially in nanotechnology, biotechnology, energy efficient technologies and other sectors. Mr. Sharma revealed that Indian pharmaceutical companies will set up production facilities in Russia to manufacture dozens of affordable generics under a long-term Russian programme to develop the pharma industry. After a slow start this year Indo-Russian trade has picked up, with increased orders for Russian fertilisers and growing purchases of Russian diamonds. The uptake of Russian diamonds is expected to triple this year to $1.5 billion, the Commerce Minister noted. He said the two countries are well on the way to increase bilateral trade from $8.5 billion last year to $20 billion by 2015.